As horrible as the attack was on the U.S. embassy in Benghazi, Lybia, it was not the first time a U.S. embassy has been attacked resulting in the loss of American lives. If you don’t know history or only listen to Republicans, who have shamefully politicized this incident due to election 2012 and their hatred for President Obama, you would be fooled into thinking that our embassies have never before been attacked, breached or otherwise endangered. Or that this incident would not have happened under a Republican administration. Not so. This article by Adam Serwer of Mother Jones sheds light on the Benghazi attack and places it into its historical context. 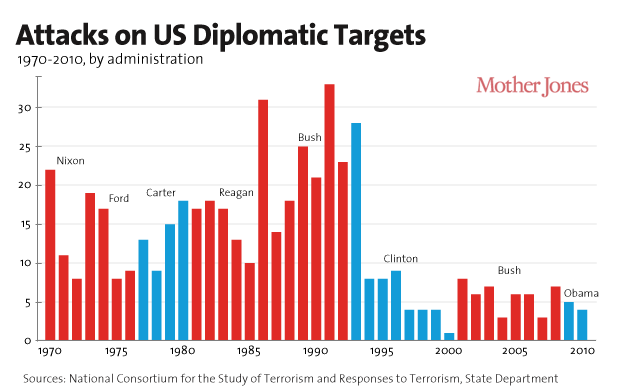 For the last 40 years since the Nixon administration, U.S. embassies and diplomats have been targets regardless of which political party occupied the White House. This entry was posted in Election 2012, Foreign Policy, History, Obama on November 12, 2012 by speakingthosethings.